President's Office after recent renovations. The University President’s office is undergoing a facelift and is expected to be finished before the arrival of the Marshall University’s new President. The Old Main office is one of many projects finishing up from this summer’s campus renovation list. 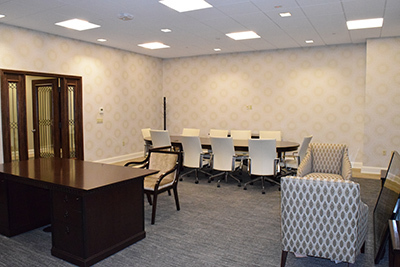 The office renovation features new lighting, flooring, a new paint-job, air conditioning units and new furniture. Ron May, director of facilities, planning and management, said he hopes the renovations add to the welcome of the future president. Along with a new office the President’s house, located near Ritter Park, is undergoing timely construction as well. Renovations started over the summer alongside other projects that are also coming to an end. The two largest summer projects, the Indoor Athletic Complex and Sports Medicine Building as well as the Arthur Weisberg Family Applied Engineering Complex are open for use but are still undergoing finishing formalities. Other finished summer renovations that students can utilize include the 1 million dollar makeover of Harless Dining Hall and the new outdoor lights at the intramural field. Some prospective projects for Marshall’s near future are being prepared for bidding this fall. Advertisements for construction bidding will be sent out in October for three projects that May said are needed on campus. A half million-dollar waterproof seating project will be proposed for the Joan C. Edwards Stadium. A project that May said needs to be done to control the water that gets through the concourse at the field. Other projects include replacing the three 12-year-old chillers on top of Harless Dining Hall, as well as installing emergency power generators in Towers Residence Hall. The generators will supply limited power during outages and allow for the use of one elevator per building. The work on these new projects won’t start until approval and formalities are met. Some summer projects are still underway and are generally kept out of student traffic.